Over the years, CreditUnions.com has published a series of popular articles on key ratios various credit union players should know. This article is geared toward exploring those ratios most important to marketing managers. Check out more must-know ratios in "15 Ratios For Board Members" and "21 Ratios For All Credit Unions." Benchmarking performance relative to other credit unions and community banks helps educate personnel about their credit union’s business model and helps managers advance projects. Comparing credit unions with similar business models, membership demographics, or geographic range lends credence to new marketing programs and helps measure success. Credit unions can track the metrics featured in this article using 5300 Call Report data. Of course, well-rounded marketing plans also consider ratios outside of the metrics featured here and link marketing plans to the institution’s strategic objectives. The population of the United States is approximately 319 million in 2014. Credit unions' potential membership base is more than 1.5 billion, which means each consumer is eligible to join nearly five credit unions. Members per potential members measures the credit union's penetration relative to the total potential membership base. The credit union’s field of membership (FOM) is the predominant driver of this ratio and acts as a proxy for market share. This ratio matters more for credit unions that have a significant brick-and-mortar investment. Credit union branches, through placement and service, are billboards for the institution. Combined with marketing campaigns and word-of-mouth, credit unions should be measuring how many members, on average, each branch location brings in. Elevated levels can result from word-of-mouth referrals, high traffic, promotions, events, or an influential business development program. Negative values indicate a net loss of members for the previous 12 months at the credit union. The amount of loans granted year-to-date demonstrates the credit union’s success at executing its lending strategy. The dollar amount of loans granted is a function of the demographic make-up of the field of membership, the breadth of the credit union’s lending operations, and the effectiveness of the credit union’s marketing and sales culture. Average member age, a FOM's socioeconomic makeup, a FOM's cultural makeup, and home ownership percentages all impact the balances of granted loans. The types of products a credit union offers is a key determinant of the number of loans it will grant. Additionally, real estate and new auto loans generally have higher balances than used car and signature loans, which will drive this ratio higher. Measuring the change in loans originated in a given quarter over the previous year helps demonstrate marketing successes; however, take note of economic climate, consumer attitudes toward credit, and the management of the credit union’s balance sheet as these will influence increases or decreases. As cooperatives, credit unions are not able to measure their market performance via daily changes in stock price. Without this type of market benchmark, credit union performance can be more difficult to gauge; therefore, identifying appropriate measurement standards is a significant aspect of credit union management. Member loyalty is a significant benchmark for credit unions, and quantifying the member relationship is a great way to gauge loyalty. Metrics about member relationship help marketing departments track how well they are succeeding at communicating the value of credit union membership and participation. The average member relationship reflects how much the retail member is using the credit union’s share and loan products. This calculation should remove outstanding business loans to focus on the consumer relationship. 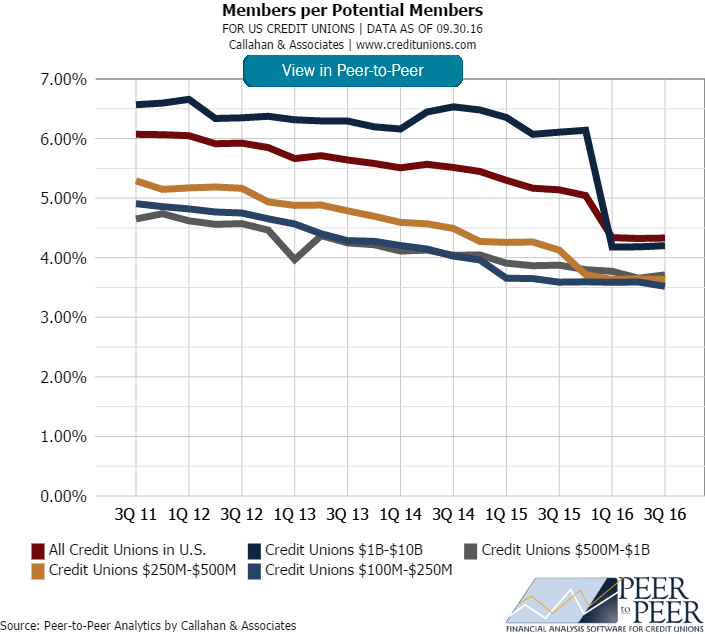 The credit union’s pricing strategy, underwriting policies, product mix, service levels, and sales culture contribute to this performance measure, as does the makeup of the field of membership (FOM) and the economic environment. Offering products at competitive rates, having a more affluent membership, and offering a variety of loan and deposit products all contribute to higher share and loan balances. The credit union’s ability to market and sell loan and deposit products also has a measurable impact on the average member relationship. How to calculate: (total shares + total loans – outstanding member business loans) / number of members = average member relationship. 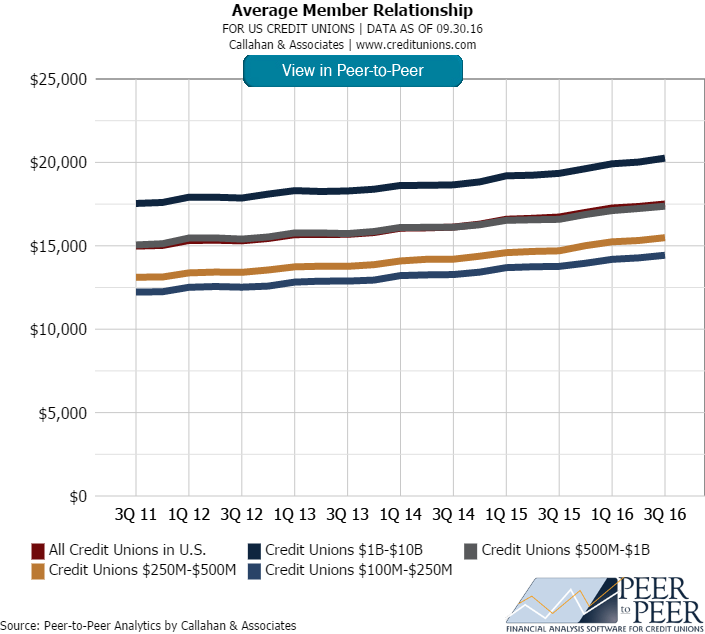 Several factors that affect share and loan growth — such as the credit union’s pricing strategies, new product offerings, the level of risk the credit union is willing to manage, the membership's demographic and socioeconomic composition, and the state of the economy — can also change average member relationship. Credit unions with memberships composed of growing industries or communities typically post higher rates of growth than their peers. Demographic factors that influence loan growth include: the average age of members, the wealth distribution of the membership, and cultural attitudes toward debt and borrowing. A credit union’s marketing, product development, delivery channels, technology, and sales culture also influences its ability to grow loans and deposits. If a credit union cleans its membership rosters or purges single-service accounts, this ratio might spike. How to calculate: (average member relationship new year) - (average member relationship original year)/ (average member relationship original year) = year-over-year change in average member relationship. 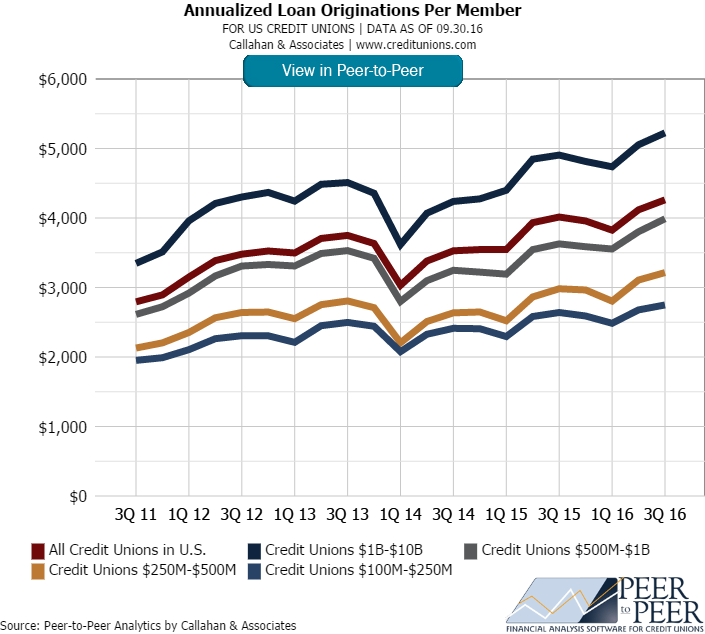 The number of accounts per member — loans and deposits — is driven primarily by the credit union’s business plan but also by its FOM. A credit union that offers a full array of financial services as well as the resources required to deliver those services should have a higher account-to-member ratio. Credit unions can use a four-step business plan to increase the number of accounts per member. First, a credit union must develop products and services — such as checking accounts, investment-type deposit products, credit cards, and real estate loans — that meet member needs. Second, a credit union must develop the delivery channels that fit the FOM. A credit union must have the appropriate number of branches, but it also might consider a call center that processes loans and an online system that provides both transaction and deposit and loan account processing. Third, the credit union must offer competitive pricing. Fourth, the credit union's sales culture must be able to promote both deposit and loan products. Credit unions that want to provide niche or limited services need to continually monitor the membership to validate such a strategy and be aware of competitive forces that could copy the strategy. Credit unions that do not have a strategy to routinely purge dormant or single-service, inactive accounts will likely also have a low account to member ratio. How to calculate: (number of loan accounts + number of share accounts) / total members = number of accounts per member. Although technically a single metric, penetration is a valuable way to evaluate ROI on marketing expenses, and there are several subsets to consider on a product-by-product basis. The percentage of membership that has an outstanding account. For example, 16% of credit union members nationwide have an auto account (some members might have two or three, some none, but on average it works out to 16%). This is an easy way to evaluate the depth of a certain product within the membership. In this example, 84% of credit union members do not have an outstanding auto loan with their credit union. The number of accounts each member has. This is another way to think about penetration. Continuing the above example, each member has on average 0.16 auto loans. This viewpoint is helpful in constructing the average member. When used in conjunction with other loan products it reflects the composition, by number of accounts, of the credit union’s loan portfolio. Both of these metrics is calculated: number of product-specific accounts / number of members = product-specific penetration rate. Few credit unions excel in each and every one of the five subsets below. 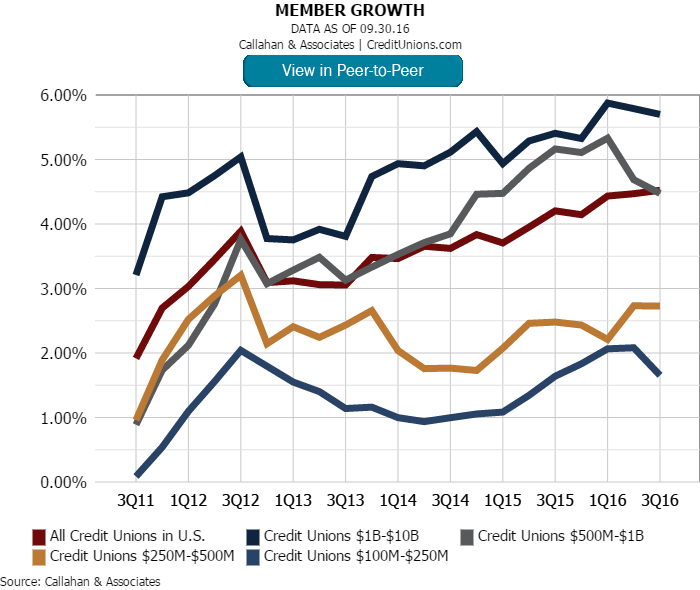 Depending on the credit union’s membership demographics, overall strategy, and individual product strengths, a credit union might grow some of these metrics while keeping others in a maintenance mode with steady penetration rates. A credit union’s share draft penetration is an excellent measure of the membership’s participation in the credit union. The checking account is generally the central account for most households. It indicates the financial institution is the one the member contacts first when looking for additional financial services. 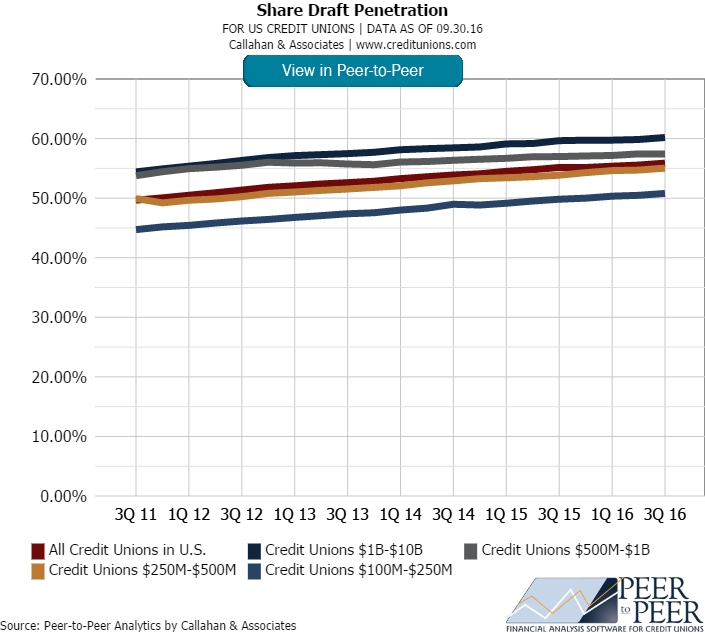 The credit union’s ability to penetrate its share draft account market is based on how well the product or products meet the needs of the members and on how well the credit union is able to communicate the product’s benefits to members. Debit card activation and usage along with associated direct deposit relationships are critical to building a sticky relationship through the checking account product. Auto loans are the primary source of income for most credit unions as they are both profitable and broadly appealing. When done right, they can also be a productive use of operational resources. However, they do carry risk, particularly if the credit union does not have adequate risk control procedures. Auto loans are also not great relationship builders and the marketplace is highly competitive. Successful auto lending credit unions generally have the following characteristics — some sort of relationship with auto dealerships either through buying programs or indirect lending programs, solid risk management policies, multiple delivery channels for loans, and effective marketing and sales programs. 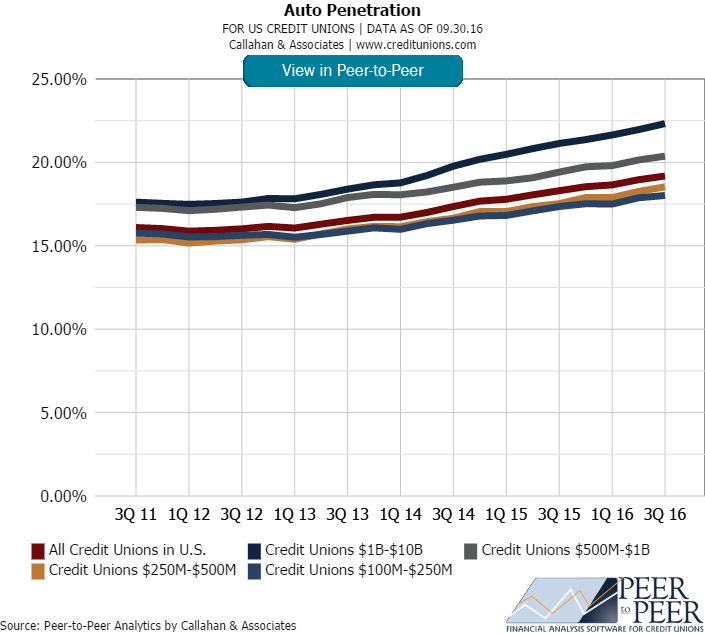 Credit unions in urban areas will post noticeably lower auto loan penetration rates than those credit unions located in suburb or rural areas. Real estate loan penetration is a measure by which credit unions can determine the percentage of members that are using the credit union’s first or second mortgages or home equity lines of credit. Several factors contribute to the value of this ratio. For example, if the credit union is mainly a consumer lender or has a young mortgage program, this ratio might be lower. This ratio also might be lower if the credit union primarily sells mortgages to the secondary market rather than keeping them on their balance sheet (the ongoing record-low rate environment makes this increasingly the case). Use care when comparing the real estate loan penetration rates using 5300 Call Report data. Advanced analysis using a combination of additional metrics — such as amount of loans sold or serviced, average mortgage balances, and market share — provides a more accurate comparison for credit unions that are strong mortgage lenders. As a financial service, the credit card is as ubiquitous as a checking account. At year-end 2009, according to the Nilson Report, there were 2.7 credit cards per person in the United States in circulation. Having a credit card is nearly essential to function in today’s increasingly cashless society. A credit card account can therefore be a relationship-building account along with the checking account and a real estate loan. Operationally, credit cards generally require more resources and a higher level of expertise. And if not managed correctly, credit cards also have risk management characteristics that can lead to significant losses relative to the portfolio. Credit unions that have sold their credit card portfolios will report few, if any, outstanding accounts on their call reports. Member usage of the credit union’s online banking portal indicates a strong relationship. Most consumers expect the availability of online account access, bill pay, and eStatements. Additional online services such as personal financial management, remote deposit capture, online loan applications and pre-approvals, and mobile banking are gaining prominence in serving members regardless of their physical location. Credit unions that do serve a disparate group of members or have a large number of Gen X and Y members are more likely to have or be investigating these delivery channels. We’ve already examined metrics relating to membership base and new business, reviewed the member relationship based on balance sheet totals and the number of accounts, and tackled product penetration rates. Now, we consider the income and expense items related to marketing. 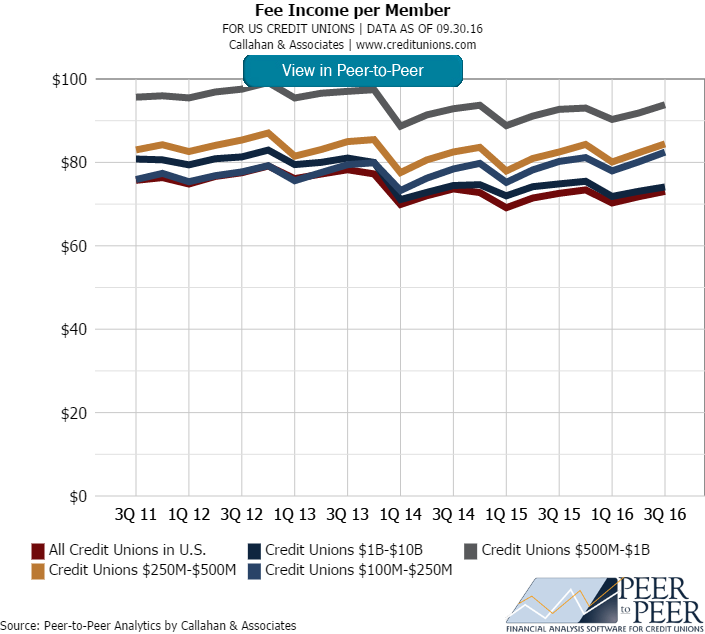 The level of fee income per member is driven by the credit union’s fee strategy, which is a function of the credit union’s field of membership (FOM) and financial structure. A credit union’s fee strategy is generally designed to fill in the shortfall between net income and the credit union’s ROA goal. Other issues include the FOM’s tolerance for fees, competitive pressures in the credit union’s trade area, and the board’s attitude toward fees. Beyond this, fee income per member can also indicate member usage. As they would at any financial institution, credit union members generally pay some type of fee to use products and services. 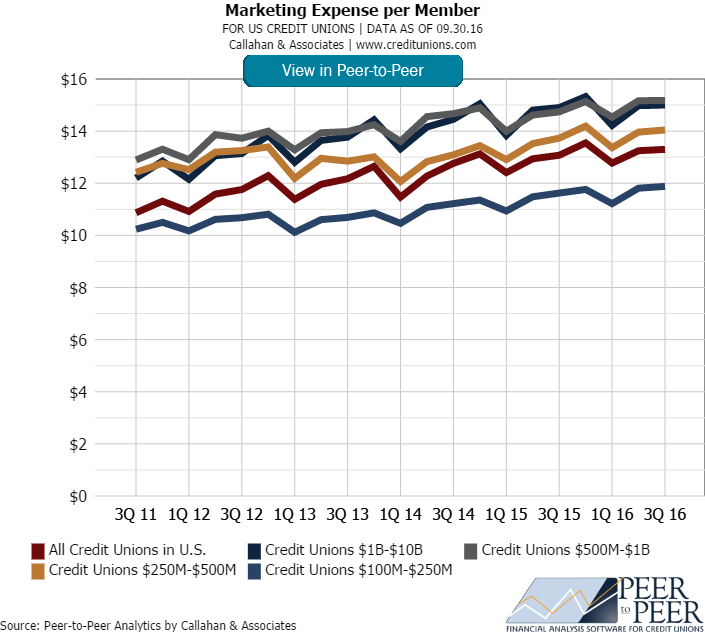 Marketers must not only be cognizant of competitors’ fees but also be able to support the credit union’s fee strategy by communicating how the credit union’s products, services, pricing, and fees fit into the market landscape. The amount of money a credit union spends per member on education or marketing expenses is driven by the credit union’s business plan, market commitment, and sales culture. Education and promotional expenses are an investment in the success of the credit union’s products and services. To ensure the investment is producing results, credit unions should evaluate the expense in terms of other measures that indicate market penetration. These measures include accounts per member, average share balance, share draft penetration, and average loans per member. This metric, while somewhat similar to the one above, tries to reconcile education and promotional expenses in a given year with the new business generated that year. Although measuring average balances and accounts per member is important, those two aspects are cumulative over time. It is equally important to measure the new business generated in a single year. Measuring the promotional expenses relative to the loans originated year-to-date and the net new share balances helps measure the more immediate return of the marketing spend. As there is a seasonal trend to savings and lending, credit unions should evaluate this metric in full year (i.e., 12-month) increments only. A year-to-date review significantly skews the data. The credit union’s demographics and members’ financial behavior will greatly affect this metric. For example, older members are less likely to take out new loans and might be spending-down retirement savings. A credit union with these members might have to increase marketing spending to entice members to open a new loan versus a credit union serving a younger membership in their prime credit years. *Current deposit balances less deposit balances as of the prior year-end. Ultimately the credit union exists to serve members; however, each credit union manager must work with the board of directors to determine profitability goals. Marketers are key employees in helping to meet those goals. Credit unions can measure success at the institutional level — such as through ROA or ROE — or at the member level. Net income per member is one way of thinking about how each member contributes to the credit union’s success. Profitability levels vary depending on member product usage, engagement, and organization contact, and the credit union’s chosen delivery networks — such as branches, call centers, and online services — as well as FOM help drive these variables. How to calculate: (annualized net income)/number of members = net income per member. Manually tracking performance metrics can be time-consuming, but with Callahan Analytics, it only takes a few minutes to see how you compare against peers. Stay ahead of the trends. Contact us to see Callahan Analytics in action. This article appeared originally on CreditUnions.com in December 2012.